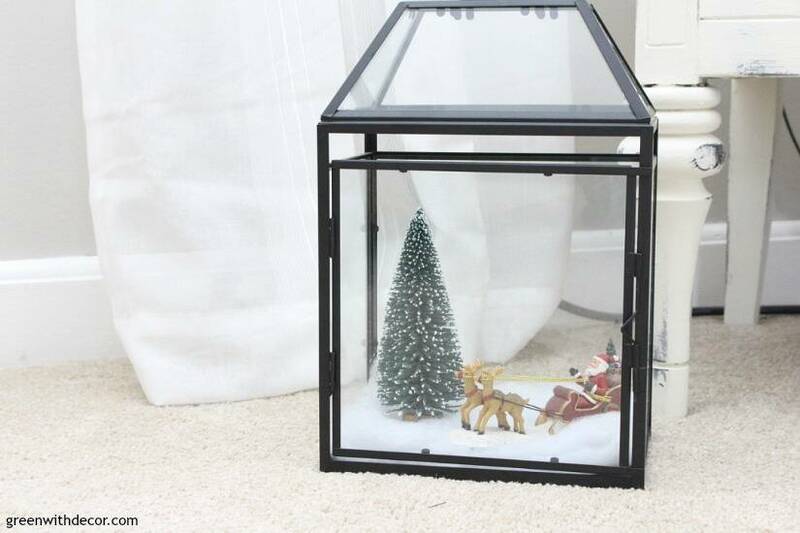 Christmas decorating should be fun and festive. 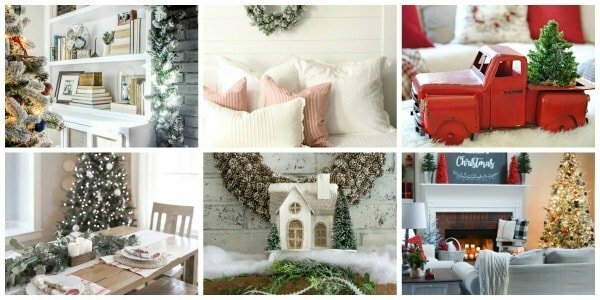 Check out these Christmas decorating ideas for the whole house, including the foyer, living room, dining room and more! I love Christmas decorating, in case you couldn’t tell from all of the Christmas blog posts lately! I’ve been sharing different parts of our house all decked out for Christmas over the past couple of weeks. I know some readers love when everything is all together in one post, so today I wanted to share a few pictures of each room all dressed up for Christmas in one place. 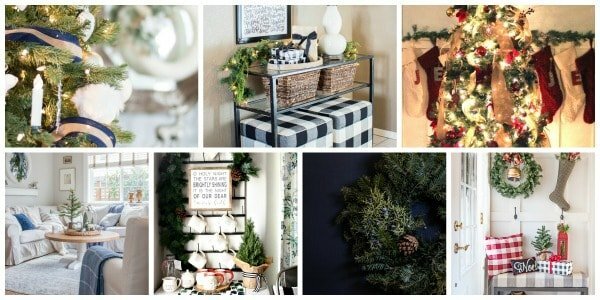 Today’s post is part of a week-long Home for the Holidays Christmas home tour series hosted by my friend Jenna from Wife in Progress. There is a great group of talented bloggers sharing their homes, all are linked at the bottom of this blog post so be sure to hop around! If you’re coming over from Flat Creek Farmhouse or one of the other bloggers on the Christmas home tour, welcome! I’m glad you’re here! You can learn more about me and my blog here or tour our house here. Maybe this is funny, but let’s start in the mudroom/back foyer, because that’s the door we always use AND it’s one of my fave spots in the whole house. It’s actually just an empty wall in our kitchen that we turned into a small back foyer, and I just love it. You can see more of our Christmas mudroom here. Okay, want to see the real foyer? Ha! It was pale yellow when we moved in, and we haven’t quite gotten around to decorating it for everyday yet, but that didn’t stop me from adding some Christmas touches. You can see the black, gold and blue Christmas tree, in the dining room, which we’ll head to in a bit. I started hanging our boxwood wreath on the inside of our door last year for Christmas, and I love it! It’s fun to walk by every day. I love it with the red truck inside. 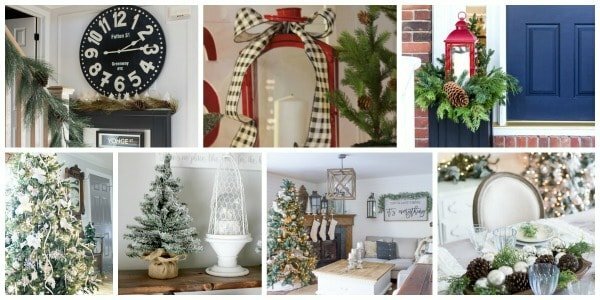 You might notice throughout this Christmas home tour that I have a thing for red pickup trucks with Christmas trees – I just can’t get enough! You can see more of the Christmas foyer here. This is my favorite room. It was darkish green when we moved in. We painted it Agreeable Gray by Sherwin Williams and just recently finished decorating it (see the coastal rustic living room here), just in time to decorate it for Christmas! Our Christmas pieces are a mix of things I’ve bought from home decor and thrift stores, pieces my grandparents used to decorate with and some DIY projects. 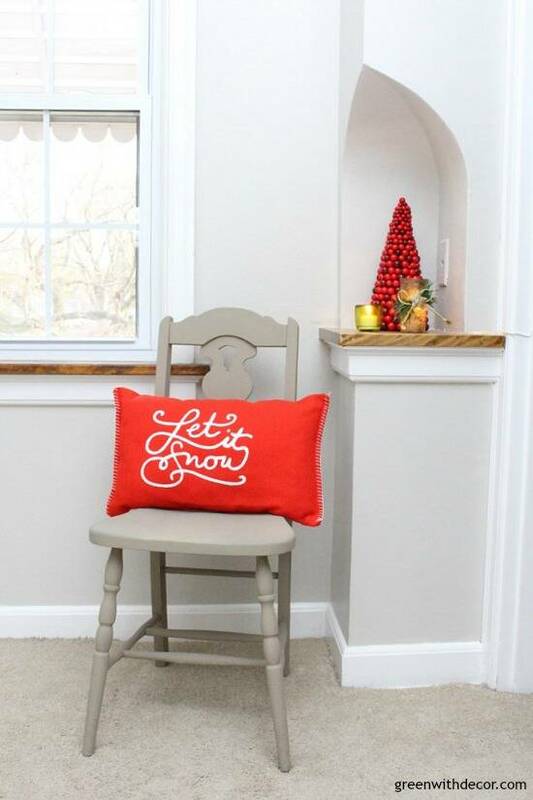 Plus I use a lot of everyday pieces as Christmas decor – it’s easy! I love mixing it up each year and using pieces in new ways. Like turning these lanterns into mini Christmas villages. They’re one of my favorite decorations this year. What is it about miniature decor that’s so cute?! I have a slight pillow obsession, and I had to get this one this year since it looks like our dog Oakley driving. … and here’s the simple Christmas mantel I planned around those cute little white village pieces. I love these wall crates we turned into shelves, and that white chippy farmhouse chest was a quick furniture makeover earlier this year. It used to be black, but I wanted to lighten it up. Our first Christmas tree is in the living room. It’s filled with ornaments from vacations, football games, special memories and a few DIYs like these icicles we made with a heat gun and that little wine cork Christmas tree. Oh and a few more red pickup trucks with Christmas trees, of course! I’m addicted. You can see more of our Christmas living room here. We JUST finished building a farmhouse dining table (see the tutorial for building a table here), and we are IN LOVE with it. I can’t stop starring at it and setting it up for Christmas dinners (for the two of us, ha!). I’ve played around a few times and ended up with a plaid Christmas tablescape and a blue and copper Christmas tablescape. Also a few things to note, we painted this room (it was red! ), but we’re still working on a new wood chandelier, a rug, benches (that we’re building) and chairs for the heads of the table, so this room is really a work in progress. You can see the coastal farmhouse design plans for the dining room here. I used a vintage toolbox, old wine bottles, berries and ornaments for a simple but festive centerpiece. I love how if you stand here you can see both Christmas trees! Since our dining table is so new, we don’t have much in terms of placemats or table runners, but this scarf works just perfectly, don’t you think?! Easy decorating at its best. My absolute favorite Christmas decor piece I bought this year is this GORGEOUS vintage sled I found for only $45!! You can click these links to see more of our plaid Christmas tablescape or blue and copper Christmas tablescape. We set up our Christmas village in the big window box, and it’s like it was made for this space! You can see more of our Christmas village and Christmas kitchen here. The upstairs has been painted and … not much else, ha! But I did add some Christmas cheer to this little landing. That chair was an estate sale find. I painted the chair with some clay paint. That cool old phone nook got a few Christmas pieces for the season. 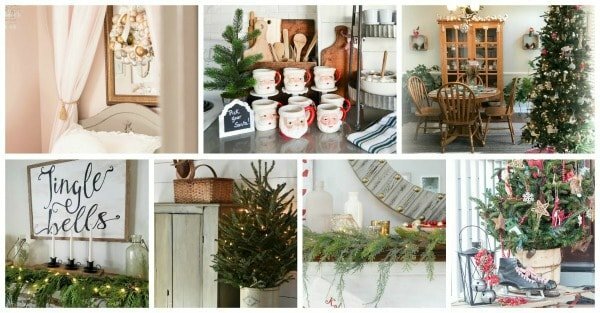 Remember to hop around to see all of the other bloggers’ sharing their beautiful Christmas home tours. I’ve been following along all week and they’re gorgeous! Atta Girl Says is next on the hop. I am loving all your beautiful Christmas decor AND I am so impressed that you built that table! Gorgeous! Enjoy your weekend! Thanks so much, Shelley! The table build was fun, and we love how it turned out! As always, your home is beautiful! Your festive touches really welcome the season! Have a wonderful Christmas! Thanks so much, Lindsay!! Have a wonderful Christmas, too! Everything looks so beautiful Meg! 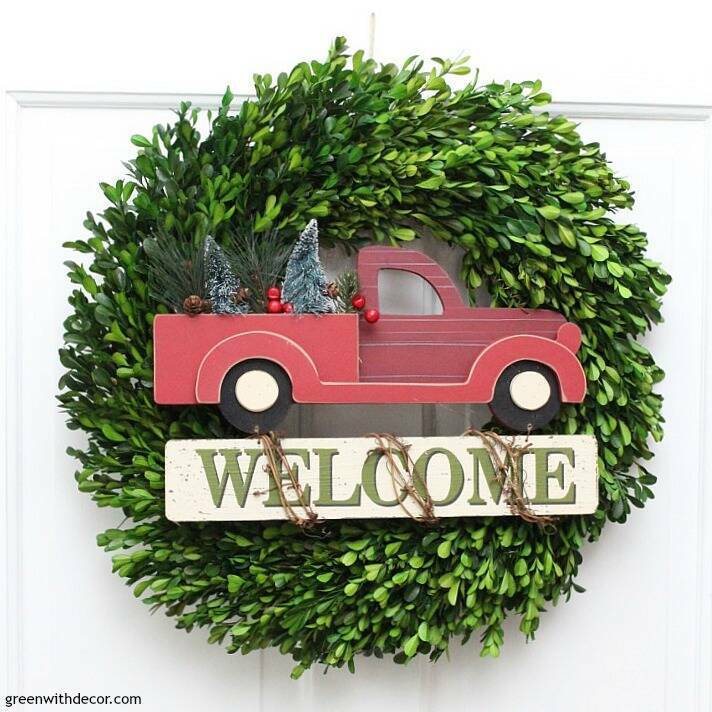 Your entry way is gorgeous, and I especially love the wreath on your door! Merry Christmas! Thanks so much, Roxanne! Merry Christmas! Thanks so much, Jenna! What a fun week! I love your beautiful home Meg. That foyer is stunning and that mudroom is just so cute! Hi Meg! 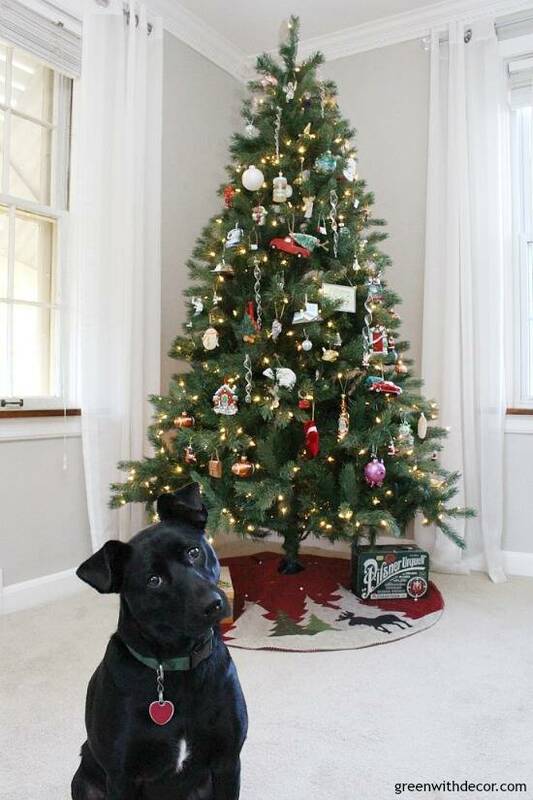 Your Christmas decor is all so pretty. I love those sweet little white houses on your mantle. Oh, and that pup of yours is the cutest! Thanks so much, Susan! She’s a cutie – and she knows it, ha! Beautiful tour, Meg! The vintage sleigh is my favorite plus too many other little touches to name! (By the way, your table is stunning!) Merry Christmas to you and so fun to be on this tour with you! Thanks so much, Kendra! We just love our table! Meg, several things jumped out at me in your beautiful Christmas decorations: putting the wreath on the inside of the door; what a creative idea; the cute back entry; the little vignette upstairs, and the two Christmas trees. The red berries and green vases are so pretty against the light walls on the awesome dining room table. Lovely decorating. Thanks so much, Carol! I love the wreath inside the door, it’s fun to get to see it instead of it hiding on the outside, ha! All these details are perfect! I love that old sled – wish I had one. And the bottle trees on your plates makes a beautiful tablescape! Thanks, Jen! I’m so glad I found that vintage sled, I’d been looking forever! I love the red trucks and the pop of color they offer! Plus your dog is adorable. What a cute idea to add the red berries to the green bottles! So festive and FUN! Thanks, Michelle! I can’t get enough red trucks this time of year. She’s a cutie, and she knows it! Love your entry! So pretty!